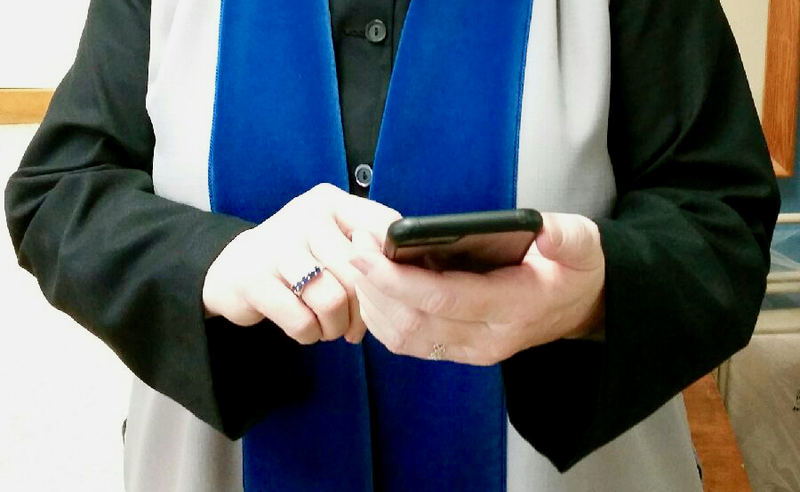 How can the cell phone help the verger in her work before, during, and after church? This is the first installment of a series of Vergers Voice blog posts called, "VTech" which is about the Verger ministry and technology. If you have stories about how you use (or would like to use) technology in your own ministry, please send them to [email protected]. Since first serving as a verger in 2006, I have noticed that I use my cell phone, currently an iPhone 6, more and more to assist in my Sunday responsibilities. Hence, I was wondering how other vergers use mobile technology. Here are some of the phone applications and methods that I have used to assist me. What other applications do you use and are there apps that I am missing? We use email to communicate on a regular basis for scheduling, service preparation, etc. On days when I have a lot of pre-service activities, I set my phone alarm to make sure I get to the sacristy in time to meet the acolytes. I use my phone as a clock rather than using a watch because most cell phones are synced in time. Therefore, when the choirmaster/organist begins playing a particular prelude for Evensong, he will tell me to process at a certain time in order to make sure that the choir is in place on time. We both use our phones to tell the time so we are automatically synced rather than our watches being a few minutes ahead or behind. I also use the clock app to show the rector what time it is at the beginning of the service since we are not always standing near each other. That way, I do not have to shout out the time and disrupt the peacefulness of the prelude. Since the Easter services begin with the nave lights dimmed, it can be difficult for the rector to read from the program of service. Therefore, I use a flashlight app to shine enough light for the rector to read the order of worship prior to the processional. The flashlight app also helps me find my way in dark corridors or find items that have been dropped in dark places. At my church, the children process to the children's chapel at the beginning of the service, but come back to the church during the peace in order to take communion with their family or come back earlier to watch a baptism. The vergers text the children's chaplains during the service to let them know when it is time to bring the children back into the church. We have also used texts to find the parents of sick children or communicate about an issue in which the verger needs to be aware. I have a copy of the BCP downloaded on my phone. Since the vergers text the children's chaplains during the service, I need to pay attention to my phone in case they (or anyone else) need assistance. I find it helpful to use an electronic copy because text messages will appear even when I have the BCP open. There is an old app of the BCP; however, I would recommend downloading the PDF copy of the BCP and opening it in an app like iBooks. The text will be small, but you can hold your phone sideways and expand the text. The vergers have been asked to call 911 should an emergency arise during the service. Therefore, I keep my phone on, but set the ringer to silent when in church. Finding the right pace for the procession during The Great Litany is always a challenge. I have a recording of The Great Litany (both traditional and modern) that I use to practice the pace of the procession prior to the first Sunday in Lent. One of the other vergers worked out the timing and marked the points in the church where we should be during the litany. For instance, I know that I should be at the St. Michael's stained glass window when the litanist sings, "That it may please thee to illumine all bishops, priests, and deacons…" Using my phone to play a recording allows me to pace the steps prior to the service to make sure we do not arrive too early or late to the sanctuary. On one occasion, a visiting minister, who knew he tended to speak too long, requested that I give him a signal when he had preached for 12 minutes. The clock app has a handy stopwatch for just such a purpose. When we have special services with large programs of service, I find it difficult to physically keep up with the program during the service. Therefore, I take photos of each page of the program (with my markings) and use the photo as a reference instead of carrying around a bulky 8.5" x 11" booklet. (The type is small, but you can turn your phone sideways and expand the text.) I have thought of using a scanned copy of the program, but find that we make enough last minute changes that it is best if I take a photo of each page of the program a few minutes before the service begins. Also, I have been known to sneak photos of acolytes on their first day of service to share with their proud parents. The vergers at my church do not sit behind the rail near the acolytes since space in the sanctuary is limited. With that in mind, there are times when I need to remind the acolytes to light the candles/torches, pick up the plates, or move the railing at communion. Instead of using hand signals, I use a photo made from the Pages app, to show them in large letters, "Light Torches", "Plates", or "Rail". The type is large enough for acolytes to read from about 15 feet away. It helps to improve communication without playing a brief game of charades, which has proven to not be one of my gifts. Abstract: This is the first installment of a series of Vergers Voice blog posts called, "VTech" which will be about the Verger ministry and technology. If you have stories about how you use (or would like to use) technology in your own ministry, please send them to [email protected]. How does the Vergers Voice blog work? The Vergers Voice in the old days was a lot harder to distribute than today, but it may have been a lot more fun! Where did the Vergers Voice come from? How does the blog work and who makes it happen each week? What are the best types of posts? Are there vergers out there who would like to help with the blog? When the guild started in the late 1980's, the very first newsletter about vergers in North America was produced and mailed by Bill Gleason in May, 1988. As the first president of the VGEC, Bill was also thee first editor and it evolved from "The News and Information Bulletin" to "The President's Memo" in 1989 and to "The President's Verge" in August 1991. In 1993, the VGEC newsletters stopped and were followed by one issue of "The President's Agenda" in 1994. In April 1995, "On the Verge" made its debut followed by the inaugural issue of the "Verger's Voice" in February 1996. It's interesting to notice how much that first issue from twenty-one years ago looks like our current blog! About the newsletters, Bill recently said, "They have always been a total labor of love with many, many people involved over the years. In the early days, I used scissors and glue and tape to put the things together and we put them in envelopes and mailed them from our house. The challenge was always getting people to contribute material for the newsletter, keeping people motivated to keep it going, and to lead the massive effort. I'm sure that's the main issue with the blog today!" In 2008, Margaret McLarty published one of the last old-style Vergers Voice newsletters and in 2009 helped launch a series of electronic news blasts called "V-Happenings" that was the birth of the current blog. The very last paper copy of the newsletter was printed in July 2010. In 2012, Ken Holloway volunteered to help start the current blog. He recently said, "The June 2012 V-Happenings asked for help with communications and since I had a lot of experience with writing and publishing, I volunteered. 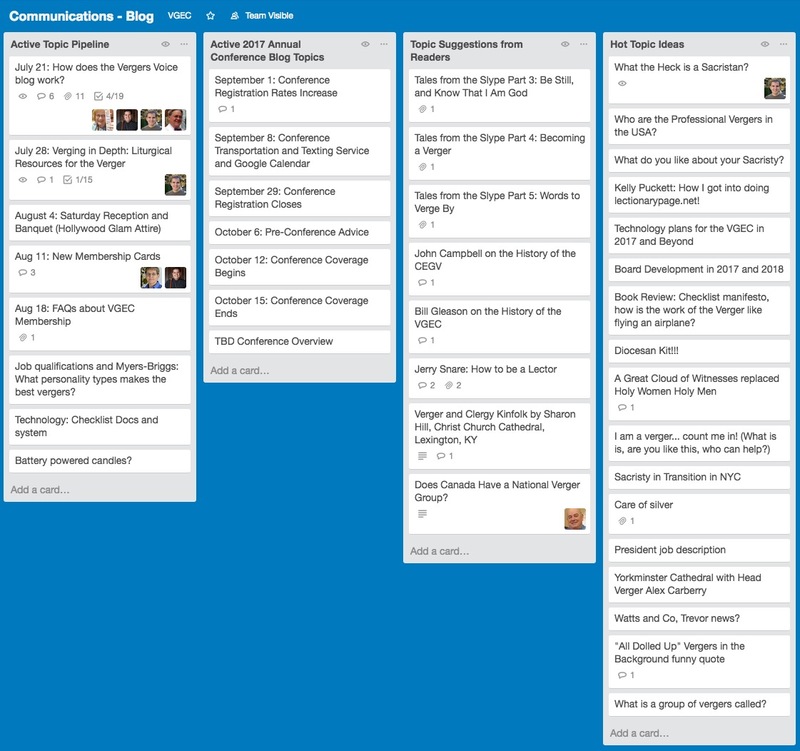 We quickly started building the process for the blog and the first stories I wrote centered on the VGEC Annual Conference in 2012. Over the years, we settled on a weekly blog publishing process in which Scott Smith came up with the topics, I wrote the blog and edited a photo for the headline, then passed the draft to Eileen Hicks as our editor, who, in turn polished the piece and passed it back to Scott for final approval and publishing. 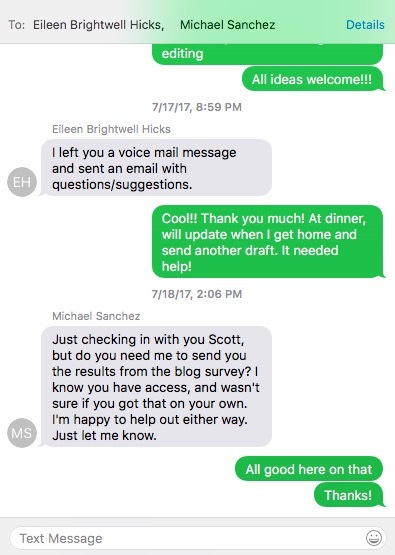 Later, we engaged Michael Sanchez to be the final "push-the-button-to-publish" guy. In 2016, Ken stepped down from regular work on the blog to spend more time as the care-giver to his wife Margaret. Today, the blog is hosted on Blogger which is one of the most popular blogging platforms available. Scott, Eileen, and Michel continue in their roles with the weekly production of the blog. Because we live almost 1,000 miles apart and are in three different time zones, we use a lot of technology to keep the process running. We use Trello as a project management tool which helps keep us on schedule and focused on the topic of the week and upcoming topics. Trello has helped us build a rich pipeline of posts that gives us great visibility into active and future potential topics ideas. Each post has a checklist to keep us coordinated and on track. Everyone in the system is alerted every time someone checks off a task. We stay in touch 100% by iMessage and SMS texting. Michael will tell you how much he loves getting texts at 5am when it's 7am and 8am elsewhere! When asked about the process, Eileen said, "Compared other collaboration tools that I use, I love the flexibility of Trello. It's very visual but it uses words, too! 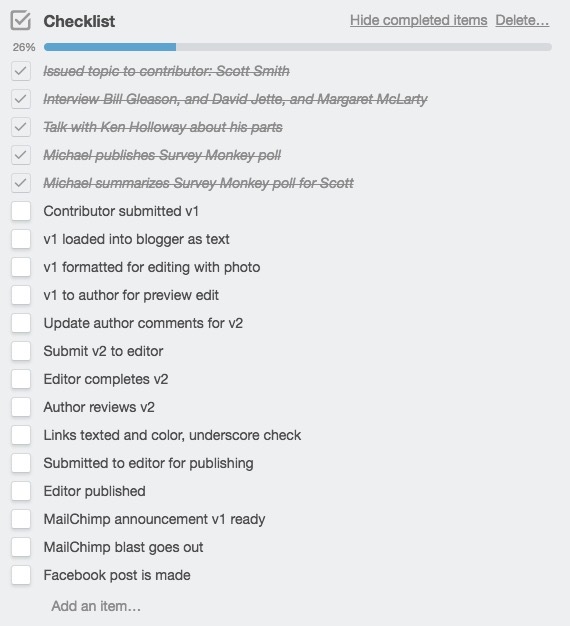 It seems perfect for verger type to-do lists, checklists, etc but you can also easily attach items and comment on anything. I use it mostly on my laptop but the mobile app is also very usable." Michael added, "I'm really happy with how the blog has progressed from the early days. There are so many moving parts to putting out a weekly blog, and like anything else, there was a learning curve when we started it. In the old days, we used an E-Mail system from a company called Emma. At the time, it was what the guild needed. However, as we grew and technology became more of a tool and necessity, it became clear that from a back end perspective, it wasn't going to be something we could continue with. There were other services that could offer more features (which made me happy) and at a much more competitive price (which almost made Treasurer Duke DuTeil crack a smile). Now we're using MailChimp, and it's been a wonderful tool. They are constantly adding new features that make my job as "E-Mailer-in-Chief" easier. As we continue to grow, we'll have an E-Mail system that'll grow with us. As I mentioned earlier, it's not something that is always visible from the membership side, but from behind the scenes, it's a most wonderful tool!" On a scale of 1-5, the blog gets 4.09 rating: we'll take it! Thank you! Take a moment to review all of the poll results if you are interested in more information. The answer to this question is a resounding YES! We have recently had several posts provided by various members and we're pleased to see that those articles are some of our most popular. Members who have been helping are David Deutsch, John Whitaker, John Campbell, Chuck Dale, David Jette, Duke DuTeil. The bad news is that the poll was blind and we cannot contact those members! If you are interested, please contact us at [email protected] and let's get moving on making the Vergers Voice blog better and better. Just remember if you answered "yes" in the poll, we cannot contact you if you do not send us an email. In conclusion, Eileen says, "The blog needs more writers! As vergers many of us can write a customary but the blog needs to be a bit more creative. I know there are vergers out there who are writing interesting observations of our humanity as vergers. Share your thoughts with us. The blog is your online newsletter, saving trees, but still binding us as a community of vergers." This is the number one thing that we hope to do with the blog over the coming weeks, months, and years - encourage members to participate who are interested in creative writing and exploring and relating personal stories about the verger ministry. 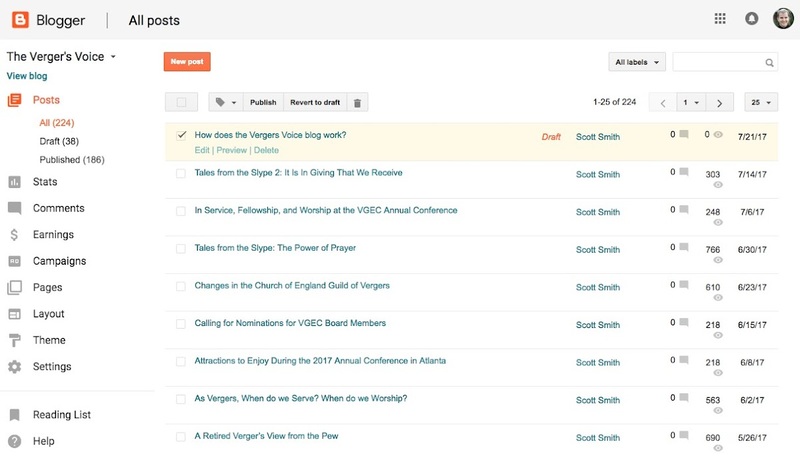 Abstract: In today's edition of the Vergers Voice blog, we look at the evolution of the blog starting back from its humble paper newsletter days to the lean, mean electronic machine we have today. Also, reader feedback and an open call to the readership for writing, editing, and HTML help. I am enjoying my down time in the slype which usually occurs between 3pm and 4pm. I am doing the crossword puzzle and just this side of dozing. Suddenly bang–rattle–bang. Someone is knocking on the slype door which generally causes the door to crash around. I jump up to see who it is. A docent enters and tells me a man and his son need someone to talk to. By 3pm the chaplain of the day–a priest from the diocese who volunteers his/her time to be on call in the nave for just such occurrences–has gone home. The canons of the cathedral are in meetings or off the Close. The one available person is the verger. That verger is me. The docent leads me to a row in the back of the nave. The father is a middle aged African-American man. I guess the son to be about 17, dreadlocks, t-shirt, etc. He sits in a row behind his dad and remains aloof and quiet. The dad greets me and explains that they both have not eaten anything all day. Can I get them a voucher for Subway? Or McDonalds? I tell them to wait while I go to the chaplain’s office. I arrive and start rummaging around for anything that looks like a food voucher. I find none. I get angry and frustrated. As I trek back to the pair, I look in my wallet. It is all ATM money: Twenties. I know conventional wisdom says not to do it. One does not give money to people who come into the cathedral looking for what some might call a handout. But I take out a twenty and approach the father. I mumble something about how I’m not supposed to do this, that I am breaking the rules. But here: Take this twenty. The father’s eyes light up. He takes my hand and thanks me profusely. But get this. The taciturn, seemingly disengaged teen age son rises from his chair and comes over to me. Whereupon he gives me one of the most humongous bear hugs I have ever received. What a sight of spontaneous compassion entwined with spontaneous gratitude! Dreadlocks mixing with a purple cassock! For me, this very emotional moment brings to life the line from the Prayer of St. Francis - It is in giving that we receive. 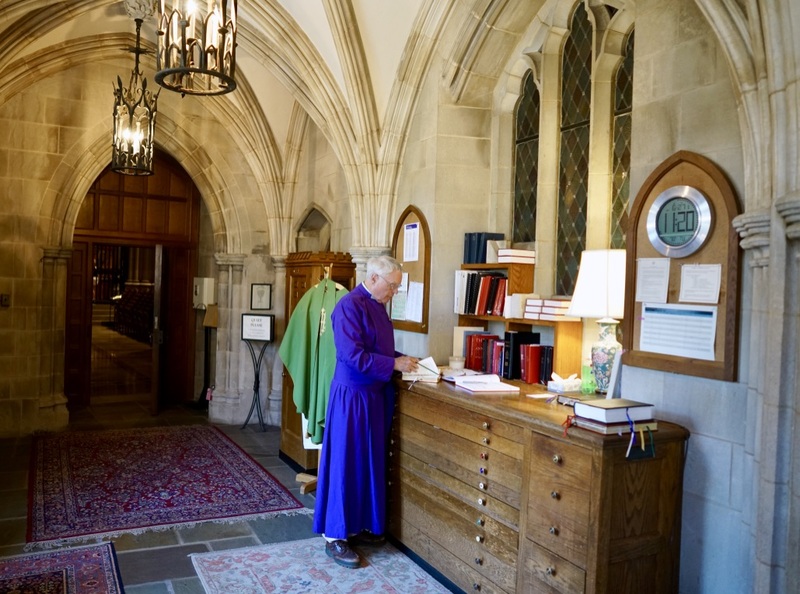 Abstract: Volunteer Verger David Deutsch from Washington National Cathedral begins a series of Vergers Voice blog posts entitled, "Tales from the Slype." In part 2, David experiences an event that brings to life the line from the Prayer of St. Francis - "It is in giving that we receive." 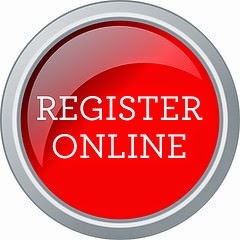 Friday morning, October 13, 2017, will begin a day of Service, Fellowship, and Worship at the 29th Annual Conference of the VGEC in Atlanta, Georgia. The day will begin with our wearing work clothes. Our Presiding Bishop, The Most Rev. Michael B. Curry, will join us for a short three block walk from the Marriott Marquis to St Luke’s Episcopal Church. The walk down Peachtree (THE Peachtree Street, not one of the 1,762 other Peachtree-named streets in Atlanta) is to make a point. We hope that this journey will ground and instruct us and give us chance to become more intimate with the dynamics of an urban church, a downtown church. Peachtree Street will be bustling with rush hour commuters, well-dressed professionals making their way to their gleaming sterile cubes, comfortable and safe in their climate-controlled autos. The buildings along Peachtree Street are clean and inviting. St. Luke’s is on the corner of the Pine Street intersection, and there is a large homeless shelter in a building across the corner from the church. The view changes rapidly as you turn the corner and head away from the heart of downtown—the buildings less and less inviting, streets no longer freshly swept, the people not so well-heeled. A block distant, yet two worlds apart, the dichotomy is striking. These are the poor among us and are some of the many clients of St. Luke’s Crossroads Ministries. Although we are extremely excited about spending time with Bp. Curry, these men, women, and children of Peachtree and Pine are definitely our focus for the day. They likely will change each of us, if our hearts are open. This can be a sacramental walk. 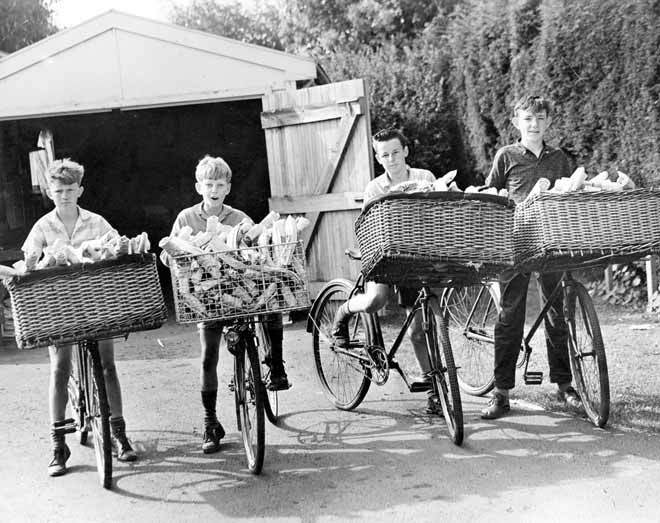 Many of us will proceed to the Parish Hall, where supplies and equipment to make some 3,300 sandwiches will be in place. We will assemble these for the Crossroads Ministry to distribute to the folks that need them. By the way, we will also be assembling a snack that your fellow vergers will eat just before the Eucharist. The bravest of us will come together to help clean up trash along the back of the campus. This may be a menial task but, in truth, is more valuable as a tool to allow us an excuse to mingle with the men, women, and children who live in our neighborhood (though seldom considered “neighbors!”). We will all gather for a light snack and find our seats for the Holy Eucharist. Bp. Curry will preach, we will sing with the wonderful choir, and experience Anglican liturgy at its very, very best. After the Eucharist, the vergers will eat lunch, prepared by Clyde Corbin, Crossroad’s Chef Extraordinaire. 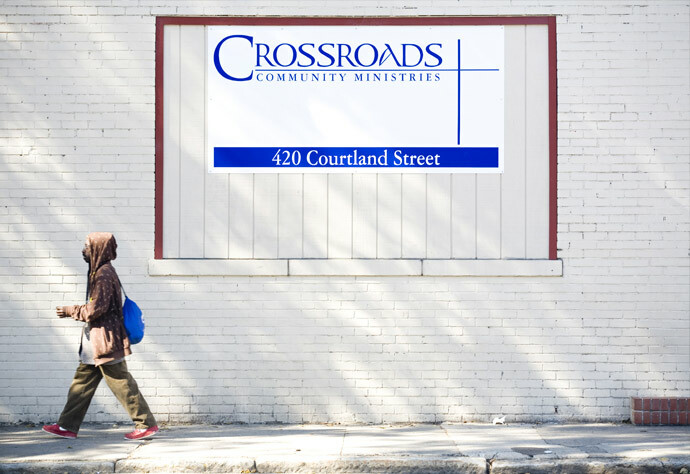 This will be the third serving shift for the Crossroads volunteers, as they will have already served the same (famous) fried chicken meal to two previous groups of 150 people, beginning at 9:45 that morning. We will all want to thank these volunteers profusely — it will have been a long day for them. There is room for about 150 of us in the dining hall; the rest of us can enjoy our lunch in the beautiful fall air on the grassy hill. This will also be a great time to wander by the table where the Bookstore is selling Bp. Curry’s new book, Following the Way of Jesus. Following lunch, we will assemble in the Nave for our time alone with the Presiding Bishop. It has been a long-standing tradition of the MEG Chapter that when we assemble for our meetings, the Bishop gathers us about, sits among us, and teaches in the ancient tradition. Some jokingly refer to this as “stump the Bishop,” but there is a much deeper, intimate feeling to this type of interaction. We began calling it formally, “Dialogue with the Bishop.” It is our fond hope that the events of the day will inspire meaningful exchange, divine meaning, and lasting memories. It is my personal wish that your walk back to the Marriott might seem different from the morning’s walk, and that the day’s events will have changed something about you and something about the places where you see Jesus. Abstract: Phillip Knight, Chair of the Mark Emory Graham Chapter of the Vergers Guild of the Episcopal Church, details Friday morning, October 13, 2017, as a day of service, fellowship, and worship for all who plan to attend the VGEC Conference in Atlanta.